The Joseph E. Hill Education Center, 1500 McDaniel Ave. Parents at a District 65 school met to brainstorm solutions for a gap in test scores between black students and white students. raised concerns about disparities in the latest Measures of Academic Progress (MAP) testing between black and white students. More than 50 parents, students, administrators and district officials gathered for a town hall on Tuesday evening to discuss the latest MAP scores and try to provide answers for the gap between black students and their white peers. According to the latest scores, no black students in the third, fifth, sixth and seventh grades met the college readiness benchmark in math or reading at King Arts. The scores also demonstrated that black students at the magnet school made up a larger part of the bottom quartile in reading and math than any other demographic group. 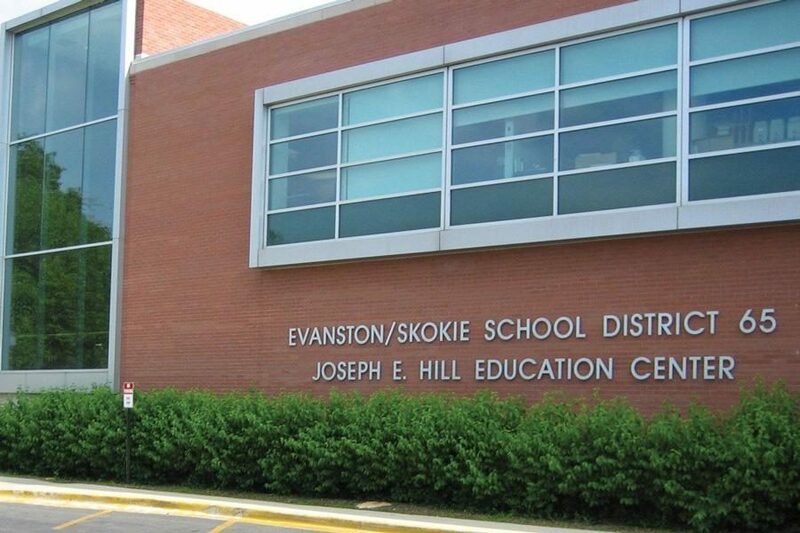 Located in the 5th Ward, King Arts is one of two K-8 magnet schools in District 65 that attracts students from both the Evanston and Skokie attendance areas, according to the school’s website. While most in the district attend the school in their attendance boundaries, students at King Arts are selected through an application process and a lottery system. 541 students are enrolled in the fine arts-emphasis school, according to the 2017-2018 Illinois Report Card. The report also demonstrated that black and white students each make up roughly one-third of the student population at King Arts, with last third filled by other racial minority groups. The event opened with testimonies by the Black Parents of King Art, an organization run by black parents that seeks to empower black students through events and programming. Following opening testimonies, principal Jeffrey Brown and assistant principal Michelle Bournes-Thomas presented on the school’s plan to address the disparity between black and white students. After looking at the winter MAP data, Brown said his team had to make some quick adjustments to support a number of students who were not meeting the college readiness benchmark. He said they have added small-group instruction and introduced coaching to remedy the issue for the time being, and he is revisiting the data to find places students need the most help. While the data provides an understanding of how students are performing, Bournes-Thomas said they have also added restorative coaching — a strategy to make students feel they are a part of a community. She said this practice develops students’ voices so they can advocate for themselves academically. Despite having resources for students, Brown said his staff needs to be more efficient. Looking forward, Brown and his team want to take a more data-driven approach to identify places where students are struggling, he said. However, Brown added that many teachers are being spread too thin to tackle all these issues. Tasha Nemo, a parent of a third-grader at King Arts and a member of the Black Parents of King Arts, understands that teachers are being spread thin, but said the district should still be held accountable for their actions. Nemo said she left the town hall meeting still confused about what caused the large disparity and how the school would solve it. For Nemo, the presentation only provided generalizations of what the resources the school provides. She said this disparity is nothing new and has been an issue for decades.